The kids return to school on Wednesday, the end of their days of sleeping until 2 PM and playing endless games of Fortnite. I even noticed last night that the days are getting shorter (and the nights longer). Darkness begins to fall around 7 PM, which feels far too early for this time of year. 6 AM no longer is accompanied by rays of sunshine. We even seem to be past (most of) those crazy hot days (though I guess there’s a heat index warning of 100 for Tuesday…). Yup, it’s all winding down. But this is the best time of year for the farmers’ market! I didn’t get around to planting my garden this year. It was on my mind, but the timing was off. When the weather was nice, I was busy; when I had the time, the weather was miserable. It just never happened. Thankfully, there is a farmers’ market held twice a week just a mile from my house. The perfect opportunity for availing ourselves of the hard work of our local farmers and feasting on their carefully grown crops. I’m a lucky girl! Summer may be ending, but I’m not ready to turn the oven on yet. I’m still in my summertime mode of simplicity being key. 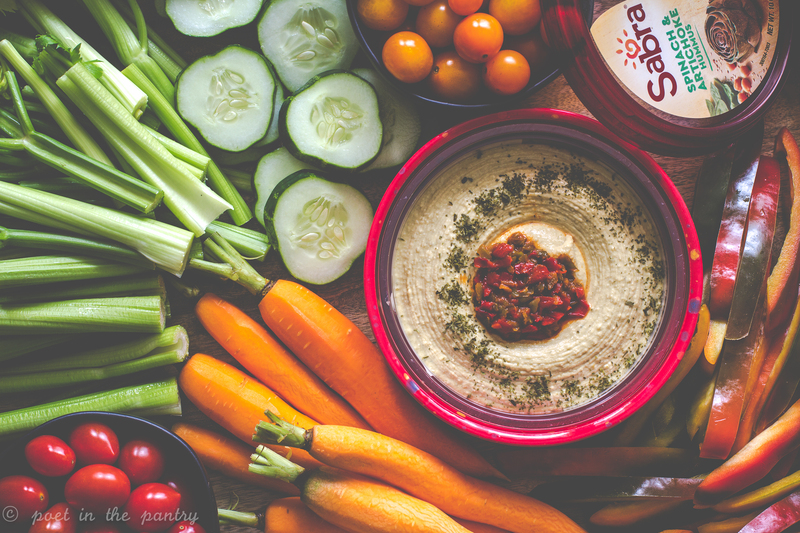 Anything that satiates hunger without much effort gets an A+ in my book. And if I don’t have to turn the oven or stove on, even better. 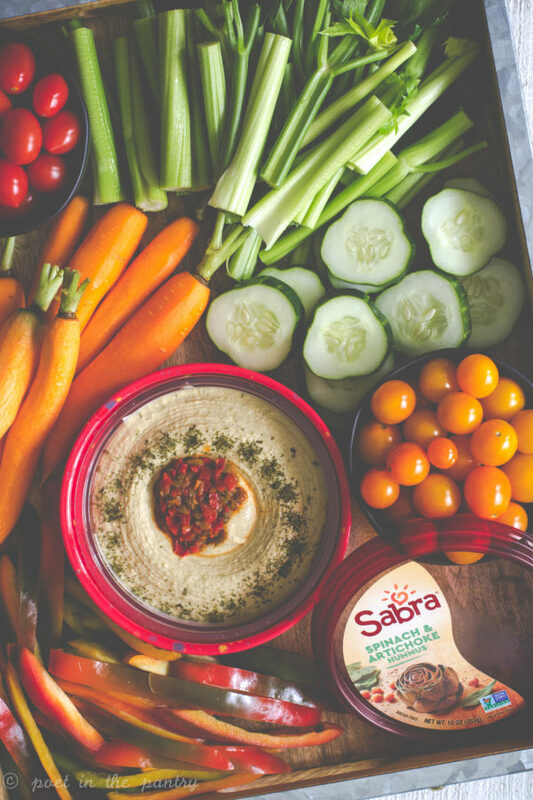 Just because the days are shorter doesn’t mean they’re any less complicated. Between karate, band practice, homework, and my own fitness schedule, there isn’t a lot of time to fuss. 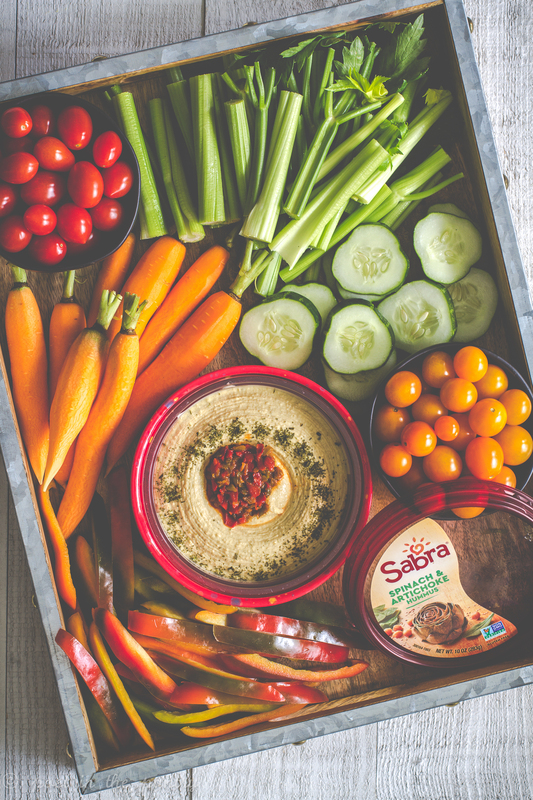 The best way to keep everyone on track is to set up a fabulous hummus board, featuring that gorgeous farmers’ market produce, complemented by all the fantastic flavors that Sabra has to offer. (I’m pretty partial to Olive Tapenade and Supremely Spicy–oh! 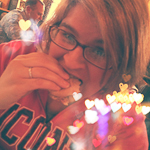 and Caramelized Onion, when it’s available–but today I went with Spinach & Artichoke). 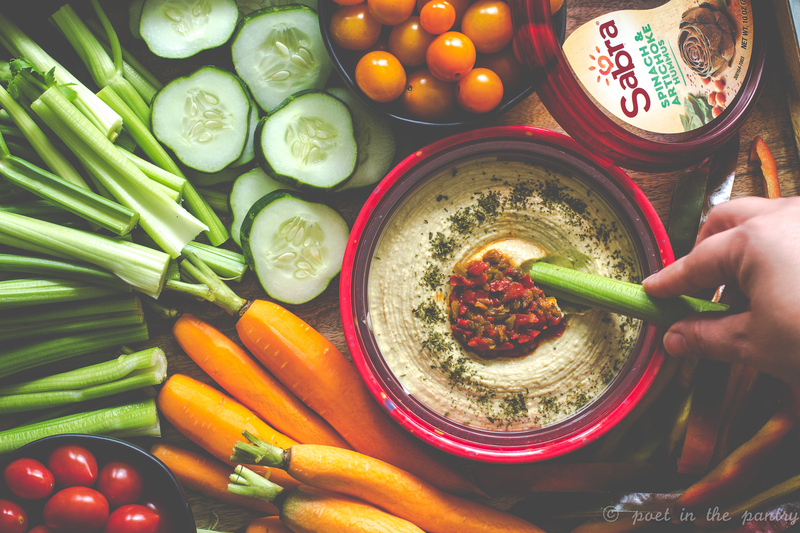 There’s sure to be a taste that tickles your fancy on their list of hummus offerings! Yup, lazy summer days lounging in the hammock, reading until I fall asleep are coming to a close. But the best is yet to come from our local farmers! 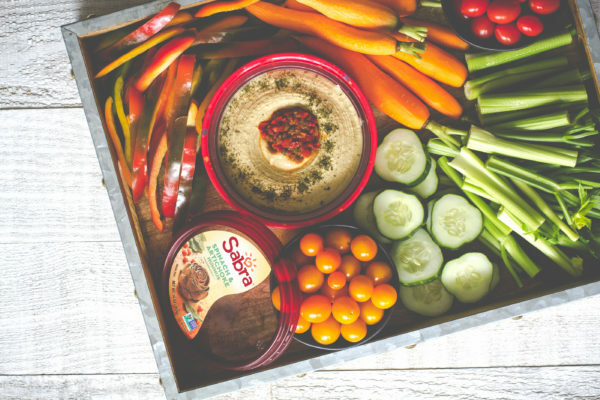 Which vegetables would you feature on your own hummus board? Did you have any great successes in the garden this year? Any failures to learn from?